I was a little uncertain going into this book originally, the concept seemed interesting but I was worried it would be the same tired story of a lowly girl who discovers she is the key to saving the world. In the basic sense, I suppose that's kind of what it was about but Holland skillfully skipped the major romance trope and focused on elements unique to the story. I am back with my final review of 2017! 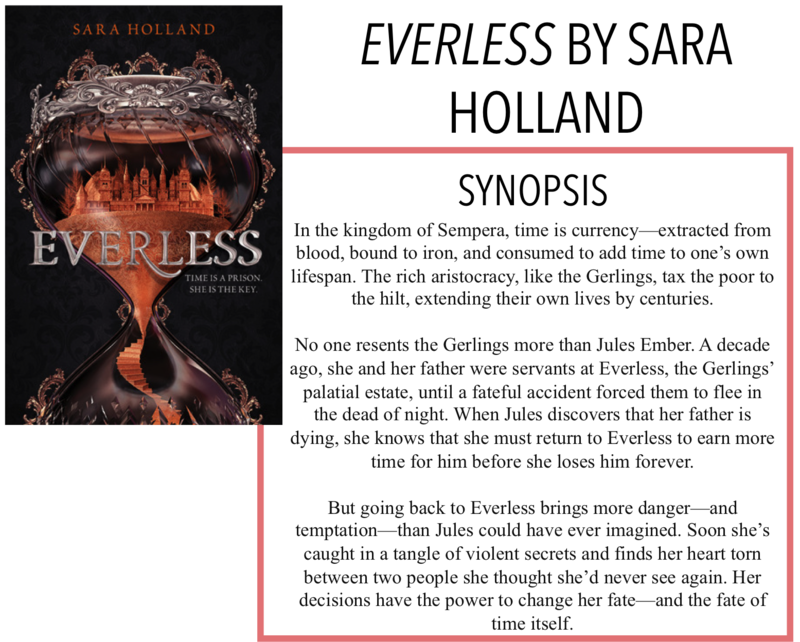 Today I'm reviewing Everless by Sara Holland. Thanks so much to Book Sparks and Harper Teen for providing me with an ARC of this book for an honest review. As always, all opinions are my own. The story follows Jules, a girl who lives with her father in Sempera. In exchange for blood-iron, the time currency made from binding blood to iron, the rich, aristocratic Gerlings, the family that has lived on the sprawling estate known as Everless for centuries, protect the citizens from blood-letters and thieves. Jules and her father are behind on payments and her father is running out of time to give. Soon Jules finds herself going to work at Everless with the family she once knew when her father was the blacksmith decades ago. But with the wedding between the Queen of Sempera's adopted daughter, Ina Gold, and Roan Gerling, the younger son of the family nearing, secrets arise and Jules learns something about her past that shakes her whole life. While it took me a bit to get into the story - whether it was writing style or plot, I couldn't say - once I did, I was hooked. The concept of time being currency was really intriguing and not one I had really seen before. Holland does a good job explaining how it worked and the different ways it can be used in the world. I think that it was really important to have the concept worked out early because it is such an integral part of the book and necessary to the plot. I also really enjoyed how Holland was able to side-step the romance issue. There was a lot going on in the story and I think a full-fledged romance would have been too much. I was a little worried because there was a set-up for a possible love triangle but after some events at the end, that clearly won't be an issue for book two. I think there was just enough build up to anticipate a romance to maybe take place in book two, but not too much that it overpowered the rest of the storyline. This book was also just generally unexpected. There were some twists that the end that I didn't see coming and some people I wasn't expecting to be allies or villains. There was a female friendship that I was definitely not anticipating and didn't know I needed to read until I did. No spoilers, but in the end it makes sense, so I'm glad things worked out the way they did. It's been a long time since I've read an underdog story, especially a villain underdog story, and it was unexpected but so welcome! It's been a long time since a hyped book was worth the hype and I think that's exactly what's going to happen with this book. The book is a genuinely unique and magically woven story that will stand out. There are some tropes that are introduced, like the possibility of a love triangle, but then they are swiftly flipped, creating an original storyline. Overall, I really enjoyed this book and cannot wait for the sequel!